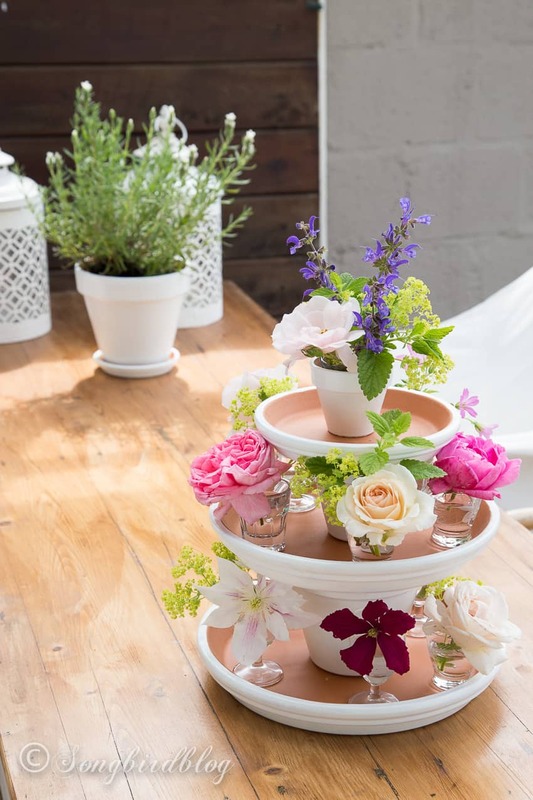 I am interrupting my summer break (thoroughly enjoying that by the way) to show off a little easy summer centerpiece that even I, in my lounging summer ways, could do. And I guess that means so can all of you. Got unexpected guests coming? In need of a little quick decorating with oomph factor? Want a conversation inducing centerpiece but not the work that normally goes with them? You like quick, easy and (almost) for free? Got you covered my friends. In fact my project of today is so easy and laid back that I think I would be insulting your creative talent if I gave you a full tutorial. I made a last-minute-unexpected-guest-decorating-centerpiece. There was a paint brush involved so I guess you could consider this a craft, but in all honesty that was about as crafty as it got. But I love this kind of decorating/crafting. I think I am actually getting to be known for it, since easy and light decorating with flowers is just about my most favorite thing to do. Lazy decorating with flowers like I do with tulips, or peonies, or roses. And I think this is the perfect summer centerpiece that will be a conversation inducing centerpiece at any garden party. And it couldn’t be more easy. 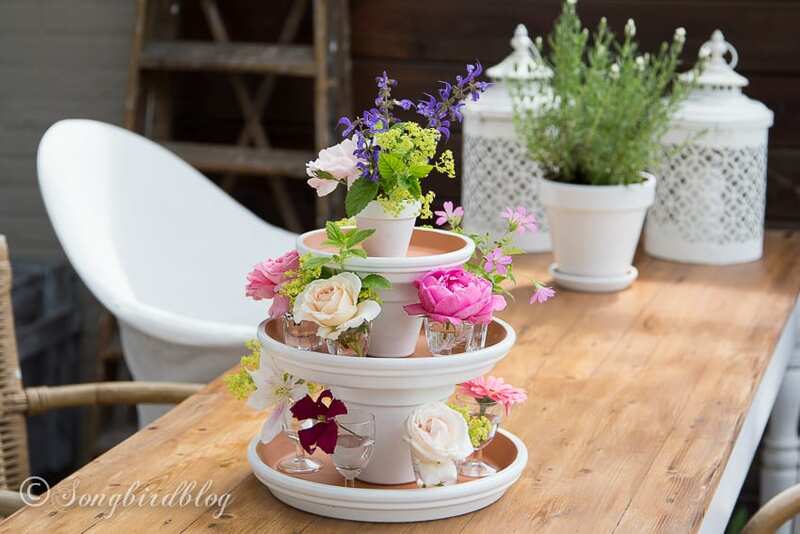 Go dig in the garden shed for some terracotta pots and saucers. Find the tiniest glasses you have. Go snip flowers from your backyard or the roadside. Put it all together and enjoy it. I kind of went for a multi-colored, multi-flowered look here. But I am sure it would look awesome in a single color tone too, or with all the same flowers. This is so easy, it can be changed in matter of minutes. So easy, but I do think it has the oomph factor. Agree?……. Yeah, what better time than summer to take a relaxed approach to crafting and decorating? I guess we’ve got the rest of the year to go for daring, challenging and complicated. Let’s all just enjoy some floral beauty the easy way instead. CU and I hope you have a rocking good summer too. PS This post has also been published as a guest post on Todays Creative Blog. nice chatting via email this morning. You’re amazing! This is such a simple but stunning idea. Just the other day I was looking at all my various sized terracotta pots and wondering how I could put them to use. Thanks for the inspiration Marianne! Wat ontzettend leuk dat je weer eens ‘langs’ gekomen bent. Ik ben ook nog wel eens bij jou wezen neuzen, en soms had je dan geblogd en soms was je weer een tijdje weg. Er zijn tegenwoordig zo veel blogs dat het echt onmogelijk is om nog bij iedereen een persoonlijk berichtje achter te laten. Maar toch erg leuk om van je te horen.